The past beckons, but we can’t go there except in our imagination. This has to be one of the most evocative analogies I’ve ever known. It captures perfectly the wistful experience of watching years roll away, just far enough from us to be out of reach. It also symbolizes the strange affinity I feel for history; looking on from the outside yet somehow connecting to those within, wishing I knew what it was like to see things from the inside. Trains are well suited as symbols with which to illustrate the elusive nature of time; just look at Einstein’s use of trains in explaining his theory of relativity. There’s something about a moving train that throws our perceptions of reality slightly askew. If we stare at a train passing, we may begin to feel as if we are the ones moving. And of course, in one sense, we are moving. We simply have the illusion that we are standing still in comparison, as time passes in front of our eyes. The passage of time really does seem like a long train with countless cars we can’t enter. We can see people waving at us from a distance that grows ever greater, until they all but vanish from our sight, but we can only join them in our imagination. Do you connect with Foer’s analogy? Have you ever wanted to be on the inside of that passing train, even briefly? Wow, thanks. I thought you identify with the quote. I’m so happy you liked the post! Yes, many times. I can’t help but imagine the train full of people that I’ll never see again, at least in this lifetime. Coincidentally, I was up late last night, journaling some things I remember about my grandparents. Susan, I’m happy you connected with this. You are wise to be writing down your memories about your grandparents. I wish I had done more of that. When I look back and read things I wrote years ago, I am astonished how much of it I had no immediate memory of until reading what I wrote. Even things we think will never be forgotten tend to be pushed out of our conscious memories by other, more recent or momentous events. This is a blessing in some ways, but the legacy you are leaving will be appreciated in years to come, by you and quite possibly by some curious great-great-grandchild who will be enriched by knowing more about past generations. I remember in grade school, a series that brought history to life. It was narrated by Walter Cronkite. The series was titled:”You Are There.” One episode, in particular, was a debate in the Continental Congress, on whether to separate from England and declare independence of the colonies. During the drama, Cronkite would act the interviewer, as though there present, and draw a representative, like Franklin, aside to get his thoughts in the midst of the debate. As a student, normally bored by such events, I was truly interested by the dramatic presentation of this event in our history. I also find it a coincidence, that you should mention the Theory of Relativity, in your post. In Sept. I will provide on my post, a topic that strongly takes it into account. Again, a great post Julia. Thank you Alan! I remember that Cronkite series, because from time to time, our teachers would let us watch it on the old massive black and white televisions that were hauled from classroom to classroom atop carts that were taller than we were (two students would usually be tasked with moving the rolling carts from the equipment closet to the classroom). I agree with you that these were engaging and memorable presentations. I wonder whether there will be anyone else in broadcast news who will ever be as iconic as Cronkite was. Be sure and send us a link to your post about relativity! It’s a subject that fascinates me, though my limited education in science in general, and physics in particular, keeps me from grasping some of the discussions. I remember those TV carts, all too well. When Cronkite retired, the mold went with him. My post, in which relativity plays a role, but not the topic; will be out in Sept. As a follower, you should be getting it. It will come first with an introduction, then follow with the maim topic. I will try to be watching for it but I’m so far behind reading blogs that I might miss it. If you don’t see a comment from me, please remind me it’s published so I can be sure to read it. I love anything about relativity and/or time. Funny how time passes while at the beach at four times the rate as during work?? Relativity indeed! Blessings from beautiful but warm Destin. How true, how true! Time flies during vacation, even more so than at other times. I’ve never been to Destin, but I’ve heard it’s beautiful. Hope you have a great time! Julia, trains are seen in movies so often and I’d never really thought about the deeper symbolism. I agree with the comments that others have posted today. 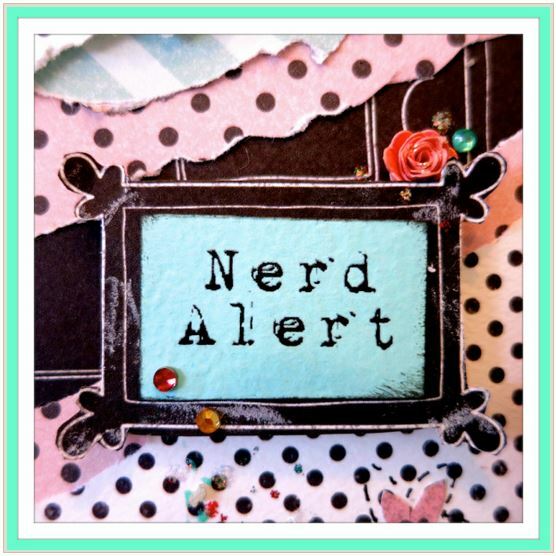 Just when I think you can’t surpass a favorite blog, you do! 🙂 Looking at the picture again, I had such a feeling of being shown to my chair in the dining car, the table was waiting for me. You’re too incredible! Thank you, Sheila – I really appreciate the way you have such generous and sunny comments about the blog. I did love that photo when I saw it. To me it’s a teeny bit eerie though, sort of a “Twilight Zone” quality, as if that guy is trying to lure us into some other dimension. 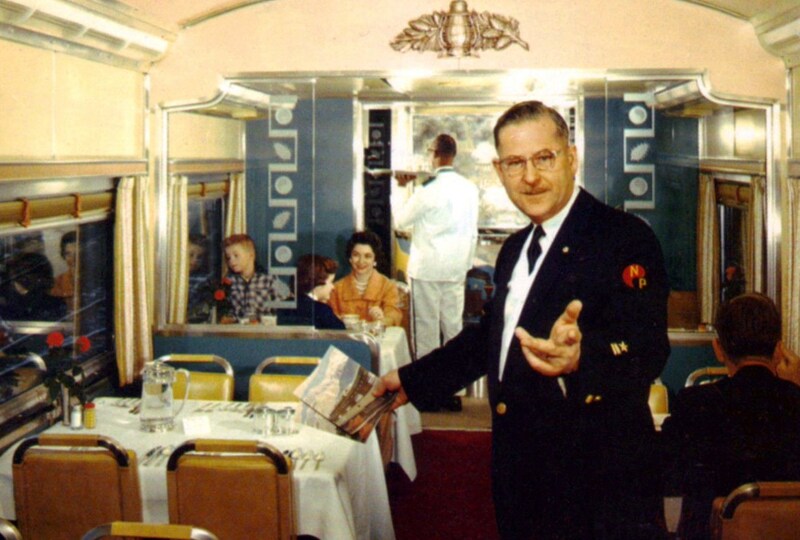 We loved eating in the dining car when we took our trip to Seattle on the Coast Starlight. I hope someday we can do it again. In 2011, a year after my layoff from Intel Corp, I made an epic journey to 5 national parks in the Pacific Southwest. I got to my starting point of this journey via a train from Portland, OR to San Francisco, CA. I had been many years since I last traveled by train. I enjoyed the experience as part of the whole bucket list trip. Bob, that’s the sort of trip Jeff and I would like to take, only we want to see Yellowstone and some of the other parks in the northwest. Did you go to the Grand Canyon? I’d like to go back there. Last time we were there, I was too sick to enjoy it (from a raging sunburn I got on my last day in Waikiki before we moved back to the mainland). Did you take the Coast Starlight to SFO? I loved being able to sit facing the windows. I have to say, I don’t usually go in for group tours but that company looks like a lot of fun. I love the descriptions of group-prepared healthy meals as part of the package. The food was amazing and fresh. There were frequent stops to restock our supplies. All food & all park fees are included in the ridiculously cheap price. I thing my entire cost was under $700. That’s amazing considering how expensive those park passes are. I love the configuration of the inside of the bus. You should see how much fun it is with the maximum 36 people onboard. Think of the way a sardine can is laid out and you’ll get the point. We only slept aboard the bus 2 nights while the drivers drove to our next location. The rest of the time we camped. I’ve camped all over the country while touring with my motorcycle. Usually on those occasions I was so tired I was dead to the world and heard nothing. Yes, I can imagine that a long day of biking would be tiring. I envy people who can sleep soundly. Camping is a joy that seems to come more naturally to some than to others. An added answer to your question is yes, I took the Coast Starlight To SFO. It was an enjoyable trip in both directions. My adventure lasted 12 days. Last night after all our train discussions I went to the Amtrak website and did a bit of checking around, since I had no idea whether the Coast Starlight was even running nowadays. It’s apparently still their “flagship” or at least the only train I found that had Wi-fi! It made me want to take a train trip just reading over their info at the website. I know it runs from Seattle to San Francisco to the Ferry Building. I think the Coast Starlight still runs pretty much the full way up the coast, from L.A. (maybe even San Diego) as far as Seattle. We caught it from Santa Barbara, going north. From there it was an easy journey to Vancouver and Victoria. I ate breakfast with a couple from Austria on my return leg. You learn to share a table in the dining car where you must make reservation. The food was really good although a bit pricey. What the heck, I was on a bucket list vacation and treated that couple to breakfast. Since we splurged and got a family car, all our meals were included so we didn’t have to worry about the prices. It was way, way better than airplane food, since it’s cooked in an actual kitchen! We thought it was delicious. How wonderful that you treated that couple to breakfast. They are probably still telling somebody somewhere about the nice American man who surprised them with such a kind gift. There was an American lady on vacation that had the seat next to me on the return home. I asked her to join me for breakfast as well and she couldn’t get over that I bought her breakfast, a complete stranger. Isn’t it fun to surprise someone in that way? I used to imagine that if I was wealthy, I would get a big roll of $20 bills and go around town at about 10 pm and give one to every person I saw sweeping up and cleaning tables at a fast food restaurant, or working as a cashier at a convenence store. But then I thought, I could be doing that on a smaller scale right now. But I still haven’t gotten up the nerve to actually do it. What you did buying breakfast for someone is a much more natural way to give. Julia, hello. Hope you’ve had a good day with Jeff and Matt. Hi Merry, I haven’t had a train ride in many, many years either, but to me there is something very romantic about them. We rode the train several times when we lived on the central coast of California. Since it was so remote, trains were actually a fairly convenient way to get to Santa Barbara or L.A. But I don’t think I’ve been on one since those years, which would have been over 20 years ago now. Yesterday was REALLY rough (at the ER almost all day with Jeff, due to bad infection and other complications from the chemo) but today has been better. We’ll home this week is easier than last week! Well, I went to Einsteins link and almost exploded my brain, LOL thanks Julia. Sorry about the brain grenade! I tried to find a simpler explanation of it online, but there weren’t any that are as good and easy to understand as the one in our book at home that we have, which was written for young people to understand (so I could follow it pretty easily). I too am horrible when it comes to estimating how long something will take. I’m starting to think time really is relative, not just from zone to zone, but from person to person! 😀 Time just goes faster for some of us, it seems. I didn’t know that about the trains but it does make sense. Until people started traveling, “now” would always be “here,” if that makes sense. Yes, I think it would be great to fly over the date line into yesterday! I got a big enough kick out of our little Skype tea party where we were talking to Dani and Pauline while it was their tomorrow but our today! If we could just get a fast enough rocket we could have the ultimate return to our younger days! 😀 BTW I love time travel stories. Raynard, I have always wanted to ride the Orient Express too. That would be the ultimate train experience, but I think the price is way more than we are comfortable spending. However I love to read about it. We did ride the Eurostar from London to Paris and it was quite reasonably priced. It was very nice to arrive right in the city instead of DeGaulle airport. WOW, riding across Germany in a train sounds good, too. Did you have one of those nice ones with cabins? Our ride up the Pacific Coast was around 24 hours but we had a sleeping car so that took up a good bit of the time. It would have been a lot less fun to be sitting in a seat for that long.